Just enjoyed viewing all of your designs! Do you have any suggestions on shading within the cells of your cloisonne or know of any publications I could read to help me out? Thanks for visiting and I am happy to try to help. I can not recommend one book on shading, but I can say for me it took time. I was a Fine Arts Major in school and only used pin and ink. My love was drawing. When I first saw cloisonne I was hooked forever and begin a quest to learn colors, and how to use colors in enamels. I began photographing everything that was of interest to me. When diving, hiking, walking, always carrying a camera. With these photo I made albums to use as resources. I would take a month or so at a time and draw and paint till I got the impact I needed in my art. Then it takes time to look and see the colors. One trick I have learned is to take a peice of paper and cut a hole in it. Place this over a picture and you can see better it is a pink white or a red green. There is more than one or two whites in a white flower petal. It makes the jewel much more interesting to use more than a couple of colors in the same family when shading. The Huma Huma on the front of the site has 29 colors from blue to green. My color plate of pinks has at least 14 colors on it. Now I know this is way too much for many artist but if I lay in half of these colors next to each other I can create a beautiful shading from light pink to dark pink by placing these next to each other. 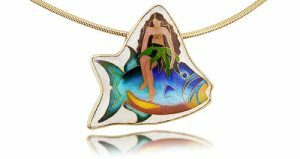 How to use colors in enameling = laying colors of enamel next to each other of the same color family, and each time you apply a layer of enamel you need to shift to the left or right to avoid a line. I like to work from dark to light. This way after a couple of layers of enamel are laid in and fired I drop out the darkest color of enamel, say it was on the right of my design, then shift all my colors of enamel to the right, I can get a very even and beautiful gradation of color! A book of watercolors I used is “Light Up Your Watercolors” by Linda Stevens Moyer. She has a couple of exercises you can try, and she uses her warm colors to bring the information forward. Also try “Colored Pencil Fast Techniques” by Bet Borgenson. She teaches Juxtaposing Color which is great for color impact. You can use her exercises in watercolors as well. The first assignment for all of my students is get a set of water color paints and a pad of hot press watercolor paper and start painting.